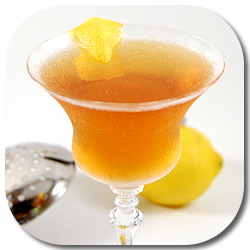 The El Presidente is a Cuban-born cocktail from the Dark Days of American tippling – Prohibition. The history of the cocktail is somewhat hazy, with several different bartenders credited with creating it in honor one or more Cuban presidents in various different bars. The drink has often been lamented as a lost treasure from the heyday of Cuban mixology, when thirsty Americans – unable to quench their thirst for great cocktails at home – would sail from Florida to Havana. While most people think of daiquiris and mojitos when they think of Cuba, there are quite a few great drinks that were poured for travelers – many of which have been almost completely forgotten. Early this year I went on something of an El Presidente kick, making them just about every night for a few weeks. 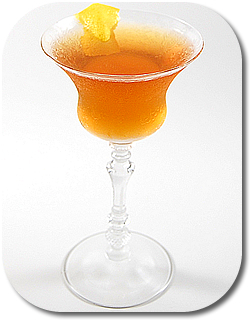 The original recipe calls for a ratio of 2:1:1 rum to dry vermouth to curacao, with a half teaspoon of grenadine. The problem is that while the drink is definitely palatable, it just wasn’t great at that particular ratio. I found out in a chat with Wayne Curtis (whose …and a Bottle of Rum introduced me to the cocktail in the first place) shortly after settling on this version of the recipe that he had drawn similar conclusions and also makes his El Presidentes with less curacao. I also find the aged rum adds character too the drink and keeps it from becoming overly sweet. If it’s still a little too sweet, consider adding a dash or two of bitters. Tweaking classic or forgotten cocktail recipes has really grown to be one of my favorite past-times. What twists or modifications to other classics do you really enjoy? I’m off to the bat-bar, old chum! I think I will try some variations on the grenadine. Its good to see people giving forgotten or almost forgotten cocktail recipes a new lease of life. I especially like to see people play with the ratios of mix. Dood…this is an amazing drink. The aged rum really makes it. My first attempt was with MGXO…fell in love. I am going to try with some others(Cruzan SB and Pampero)…. It will be a good night watching the Backyard Brawl!!! The Pampero is great in this. Oddly, I haven’t tried with Cruzan Single Barrel. I think I know what I’m drinking tonight! OK….although Pitt lost the brawl – I enjoyed my el Presidentes!!! Not so much a tweak as an omision. While looking through recipes to use Fernet Brance I came across the Corspe Reviver #3 in Charles Schumann’s American Bar. I have Fernet and brandy but no creme de menthe so I just left it out. I left it out and replaced it with bitters. You make a very good point. I know that at Death & Co. and at several of the bars in LA they are making their El Presidentes with reduced curacao but added simple syrup, which is probably a more accurate recreation of the original drink. I’ve had that style of ElPres and it’s very, very good. A recent conversation with Marcos Tello has me thinking that another post about the El Presidente may be in order. Garnished with an orange peel and/or a cocktail cherry. The result is a pleasant, dry, refreshing drink. I would say it’s worth a try. Ive found that a blanc vermouth brings this drink together a little better than a dry. Here’s my recipe. Cheers. Totally agree on the blanc vermouth. I like to use .75 oz Dolin Blanc with Clement VSOP as the rhum. Tony’s recipe is the one I found in the Bartender’s Pocket Pal (a rather small but comprehensive guide sized to fit into a vest pocket) decades ago. This one dated from the early-mid ’50s, latest. The 1.5 rum: 0.5 curacao: 0.5 vermouth: dash grenadine seems to be “authentic,” at least to one of the definitive mixing guides of the era. As a young man, I would frequent the late Rainbow Lounge (across from the Rainbow Room), atop the (then-)RCA Building, in NYC. When I first ordered an El Presidente, I was completely non-plussed when the bartender asked “Old or New style?” It seems the above recipe is the original (“Old style”), while the newer version is considerably drier, with little or no grenadine, and the vermouth cut back, giving the drink a more aggressive, rum/orange “bite,” reminiscent of Caribbean traders of old. However, my distinct preference is for the refreshing civility of the original. It’s important that the vermouth be light enough (e.g. – M&R is quite “syrupy,” and must be used very carefully, if at all, in this drink). To avoid overpowering the rum, definitely use a bolder DARK rum (as called for in the recipe); no other adjustment should be necessary. I used to make these by the pitcher (expensive, but a wonderful all-season drink).